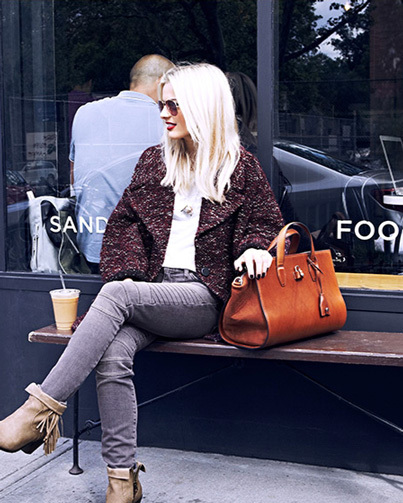 That Elle Strauss, an unerringly chic NYC-based stylist (and my former co-worker at Lucky!) is wearing moto jeans in this picture means only one thing to me: moto jeans are a must. Now. Current Elliot's version of the moto, which Elle is wearing, above, are rendered in the best faded black wash and feature all the cool biker-y details that make them look so this very minute. Of course, these jeans are practically sold out almost everywhere online except for here (use code AUGSFA for free shipping through midnight ET tonight). Also, one size left here too. P.S. Elle is also sporting this Nicholas cocoon jacket, this Alexander Wang bag, and these Sam Edelman boots. anthropologie.com still has them too! I assume her boots are Sam Edelman (part of Elle's pick on shopbop.com), but I also like the Christian Louboutin's on Barney's site http://www.barneys.com/on/demandware.store/Sites-BNY-Site/default/Product-Show?pid=502276281&cgid=womens-boots&index=18). Obviously, if one were choosing price, the Sam Edelman''s, but just look? What is the bag she has? Would love to know, Thanks! J'adore, the color of the bag is very pretty with the jacket!